If you live in or near London, you can turn to Reload Internet to get your Mongolian passport photo or visa photo taken and printed correctly. These images are produced only by our trained staff to ensure that you get a set of high quality photos which are necessary for your Mongolian passport or visa application. 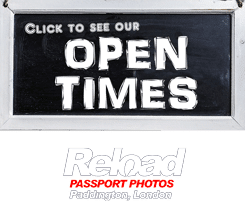 You do not need to have an appointment beforehand when you have your Mongolian passport photo or visa photo taken by us, you can just walk in to our store located in Paddington, London, and one of our staff will happily assist you. We are open every day of the week at Reload Internet, from early morning until late evening, so you can visit us at a time that suits you. We aim to have our customers passport and visa photographs ready within 5 minutes of their arrival at our store. We are situated on the same street as both Paddington Tube station, and train station, making us extremely accessible for everybody in London. Our staff will provide you with a set of high quality photographs at an affordable price. 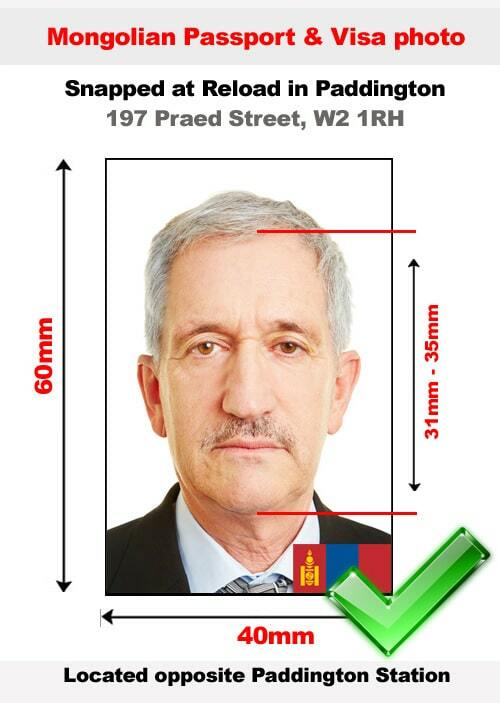 Using the latest camera and printing technology we can ensure that your Mongolian passport photo or visa photo is up to standard, and will pass when you submit it with your application at the Embassy of Mongolia. Therefore we can guarantee that all passport and visa photographs that we produce will pass first time when you submit them to the required Embassy. When you submit your Mongolian passport or visa application, the photograph needs to meet every single one of the specifications made available by the Embassy of Mongolia. If your photo fails to meet all of them, it will be rejected, which can cause delays and may even affect your travel plans. At Reload Internet we guarantee this will not happen to your application. Ideally, these pictures will include the top of your shoulders as well as an up-close shot of your face that will take up roughly between 60 percent and 80 percent of the image (or between 36mm and 48mm measured starting from the bottom of the chin to the top of your head). The images that you submit must show your facial features very clearly, with the image taken from a straight-on position. It is important that your head is square to the camera when the photo is taken and not taken portrait-style, where your head is tilted or angled. This position will ensure that the photo includes the bottom of your chin to the top of your head as well as showing an even amount of both sides of your face. Any image that does not have you directly facing the camera will not be accepted. If you have voluminous hair, the hairstyle and your head must be included in the image as best you possibly can without reducing the actual size of your face in the picture. You need to have a neutral expression and the image cannot be older than 6 months because it needs to be a recent image to ensure the likeness of images. You cannot smile, frown, or show your teeth in any way in the photo and you must also have both eyes open without any squinting. Headwear is not typically accepted in these images unless there is a medical, cultural, or religious reason as to why you wear the headwear on a daily basis. When the picture is taken, the camera must be at eye level with the person who is having their picture taken. The images must only have neutral colors and your skin tone needs to appear natural in the image. After the photograph has been taken, the photo must be printed on high-quality photo paper and have a print resolution of 600 dpi at a minimum. These images cannot be manipulated digitally as a way to erase any imperfections in your face. The photograph itself cannot be submitted with creases or any other imperfection. If your photograph fails to meet any of these requirements, then it will be rejected by the Embassy of Mongolia. At Reload Internet we guarantee that this will not happen, and that your photograph will pass first time when you submit your application. We receive all of our specifications directly from the official Embassy of Mongolia’s guidelines on passport and visa photographs, which can be found here.